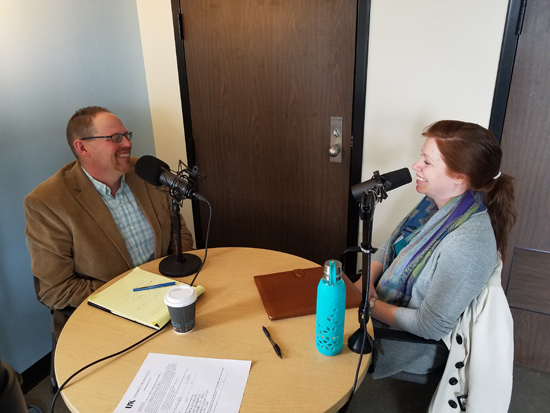 When I expressed my interest in creating a podcast to my colleague Jason Johnston, MDiv, MEd, he greeted it with a mixture of encouragement and caution. "Let's give it a try, and see what happens. But there are tens of thousands of podcasts out there." Now, 12 months, 19 podcasts, and 12,000 listens later, we have established the Social Work Conversations podcast (https://socialwork.uky.edu/podcast/) as a monthly endeavor hosted by myself and produced by Johnston. Increasingly, podcasts are part of our constant media diet. I would often listen to them while running, commuting into the office or, some semesters, as I commuted to teach classes in eastern Kentucky. I had become enthralled with podcasts ever since listening to the riveting S-Town produced by NPR. That particular podcast had drawn me in, and I "binge listened" to episode after episode. It struck me then how podcasts were a portable tool for storytelling and a possible way for us in the University of Kentucky (U-K) College of Social Work to tell ours. I have long been familiar with Jonathan Singer's, PhD, LCSW, exemplary The Social Work Podcast, and have used it in my graduate classes over the years. Starting Social Work Conversations terrified me. I felt that I could never measure up to Singer's witty and comprehensive interviewing style. But, as social workers do, I decided to cast my net and do my best. Johnston and I came up with the idea of using the tagline that our podcast "explores the intersection of social work research, practice, and education. Our goal is to give our listeners practical tools they can use to change the world." Indeed, I have learned so much from just these first 19 episodes. As we planned the first podcast, I developed some standard questions to use in the interview. I wanted to touch on some of the same themes week after week, but also make it feel like we were having a natural conversation over coffee. The first podcast was Johnston interviewing me with many of these same questions. We wanted to test out the format, but also introduce the listeners to us as people and the purpose behind the podcast. We covered questions that have become consistent themes throughout the first year: How did you get into social work? What is your work like? What do you do for self-care? Our hope for the podcast was that social workers listening would not only learn, but also be strengthened for their important task. On Episode 6, I was thrilled to speak with my former student—the perfectly, if ironically, named Laura Flowers—about using community popup markets and gardening to address urban food deserts. Another similar alum is Josh Nadzam, MSW, whom we had on Episode 14. He started a nonprofit called On the Move Art Studio (https://www.onthemoveartstudio.org), a mobile art room that travels to low-income neighborhoods in a refurbished vintage trailer. The podcast ends with Nadzam, tongue in cheek, demonstrating how he is practicing in case he ever finds himself in a "rap battle." We want our listeners to come away with an understanding of how social work advocacy can be creative, important, and fun. One unfortunate, but important, concern we covered this year was suicide. Episodes 3 and 4 featured Julie Cerel, PhD, a professor at U-K as well as the president of the American Association of Suicidology. We talked about suicide in the media, her research regarding loss survivors, and helping those at risk; one of my areas of clinical practice and research is suicide among first responders. On Episode 18, I spoke with Rebecca Willis-Nichols, LCSW, Lexington VA Medical Center suicide prevention coordinator. In the podcast, Willis-Nichols says, "For veterans, what we have found [is] it's not that they want to die; they just don't want to live the way they are." I learned from her that the same interventions that work with veterans—e.g., gun locks, providing a safe way for them to return to meaningful service—also work with police officers and firefighters. These were powerful moments on the podcast. Perhaps one the most moving episodes was Episode 12, where I interviewed my mentor, Vernon Wiehe, PhD. When I was a graduate student at U-K in the mid-'90s, I became friends with Wiehe and his wife. Over many cups of coffee, he finally convinced me to pursue my doctorate. I was the first person in my large, rural family to even attend college, so the thought of tackling a PhD was the farthest thing from my mind. What a thrill it was, 20 years later, to interview the person who literally changed my academic trajectory, and to allow him to tell his own story about his groundbreaking work in sibling abuse. Another emotional podcast was talking to retiring professor and former dean, Kay Hoffman, PhD. She has impacted many social workers with her 20 years in our college. With her, I talked about the future of social work, the importance of ethics, and the power of literature in social work education. Hoffman tells stories of her 38 years in academia and what is next for her life post retirement. Even via recorded audio, I believe her passion and energy for social work is contagious. We have also covered topics such as bridging research and health disparities in Appalachia (Episode 13), maternal mental health (Episode 12), and disaster relief among elders (Episode 16) with Allison Gibson, PhD, and Nancy Kusmaul, PhD. I spoke with social workers about saving lives on death row (Episode 2), intergenerational social work (Episode 11), and the strength of the NASW with Kentucky Executive Director Brenda Rosen, MSW, CSW, ACHP-SW (Episode 8). We have explored cutting-edge topics such as trauma-informed practice (Episode 7), our most popular podcast to date, as well as longtime issues such as supporting military mental health after deployment (Episode 5). We have tried to address a number of audiences and interests, including youth, veterans, elders, researchers, and practitioners. As we talk with social workers about their work and their stories, we have realized again the diversity and importance of this calling. In reflecting on this first year, I would like to offer some words of advice to anyone who is contemplating starting a podcast. First, find someone who is skilled in producing. I can't stress enough how much Johnston, our college's director of teaching and learning, has meant to the podcast. I am a lecturer in the college, and a therapist in private practice, so interviewing people and talking with them about their story is something I very much enjoy. Technology, however, is a different story. Johnston, who owned a professional music studio for many years, is a master at editing out my flubs, packing the podcast in a way that is visually engaging, and posting the finished product to the various platforms for distribution. Second, I would suggest making the podcast your own. As I mentioned earlier, to me, The Social Work Podcast is the exemplar of a professional podcast. Singer clearly does an immense amount of research and preparation for each episode. My schedule will not allow this, so I have become content with a more conversational, less academic, approach to Social Work Conversations. Finally, I would recommend using the podcast as a vehicle for student learning. We have been very intentional about engaging a wide variety of students, community practitioners, and faculty members in our podcasts. The depth of topics and guests on the program has been very helpful to my students, by their report. It also allows students to get to know their professors and community partners on a relaxed and personal level. Podcasts are a great alternative to video or written content in a social work course. Social workers are everywhere, championing the young, the old, and those without a voice. Serving those in disasters, on the edge of life, and without hope, helping people to find the food, the therapy, the medical care, and the support they need. This world needs the varied ways social workers stand in the gap and create a more equitable, just, and caring society. As I always close the show: Now, let's move this conversation into action. — Blake L. Jones, PhD, LCSW, is a lecturer at the University of Kentucky College of Social Work and host of the Social Work Conversations podcast. Jason Johnston, MDiv, MEd, University of Kentucky College of Social Work director of teaching and learning and producer of the Social Work Conversations podcast, contributed to this article.